That man knows how to “smile!” for the camera. CHEEEEESE! Rich Caringi wanted to separate his Carbon Cub from the others at the field… “a trainer, no more!” … Now it’s part of the Allied invasion of Europe! Wow… Looks great… Nice job, Rich! Rich, Terrific paint job and scale markings. 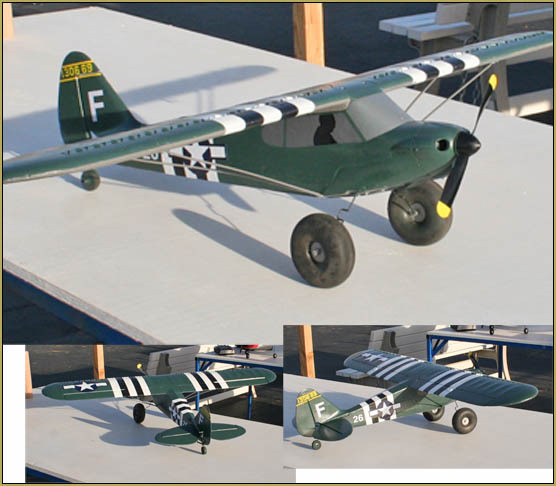 Foam guys…..have no fear of recoloring and just like that you have a new plane. Hours of labor, the challenge of another maiden, and perfection. 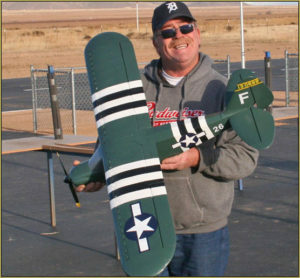 Rich’s pride in his WWII Cub is truly justified. Most everyone with Cubs are like silver and yellow I have a red and white one and now yours looks fantastic with its new paint job, schedule of juniors maybe it will inspire others including myself to do a little paint job on ours.